I’ve got quite a mouthful for you this week, both in the name of this restaurant, and also in the vast portions that we ate on your behalf. I’ll get round to the latter shortly, but first let’s start with the Who’s Who. I’ve visited The Dyke Neuk several times before, as the Wansbeck Valley in which it sits is one of my favourite parts of Northumberland. 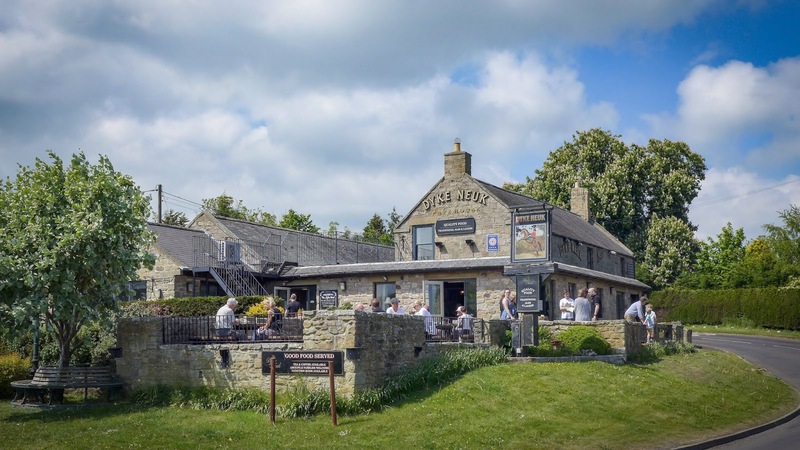 Despite its undulating hills and sparkling river, this area between Morpeth, Belsay and Kirkwhelpington is a bit of a culinary desert, and sadly the food the Dyke Neuk was never worth writing home about – let alone on these pages. Despite its location right next to Meldon Park, which used to have a decent garden café, it eventually found itself without anyone to take on its lease. In stepped a pair of local businessmen, George Bowman and Craig Taylor, regulars both. 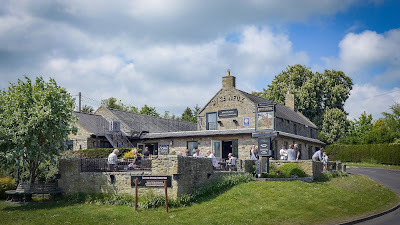 So far so laudable, but as anyone in the rural pub game will tell you, a solid food offering is what brings that vital, spendy stream of townster folk out at weekends and evenings. 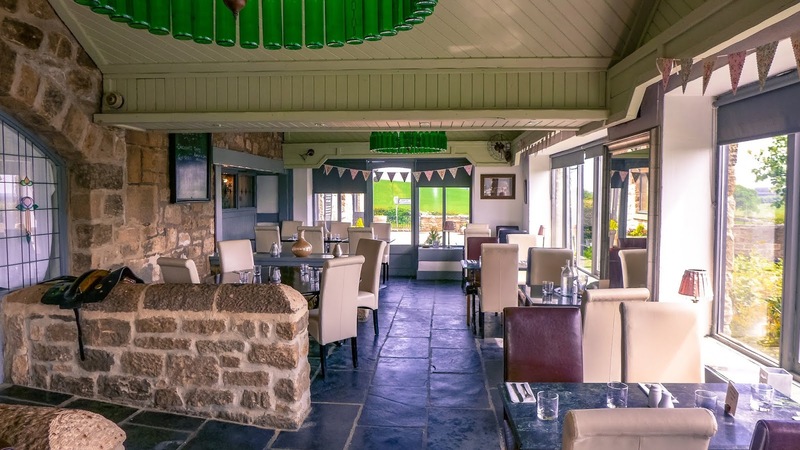 Bowman and Taylor hit upon the idea of sub-letting the kitchen operation to an established business and persuaded Michael Hall, head chef at The Granby Inn in Longframlington (3 stars in my book) to be that business. 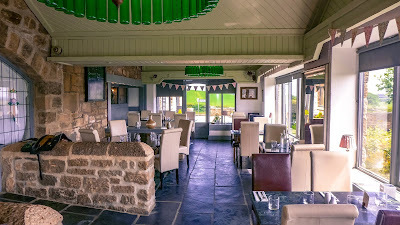 And that’s why for couple of months, we’ve had the geographically confusing but nonetheless accurate moniker: ‘The Granby Inn @ The Dyke Neuk’. This might be of interest to those of us geeky enough to follow such things, but what really matters, as ever, is what turns up on the plate. 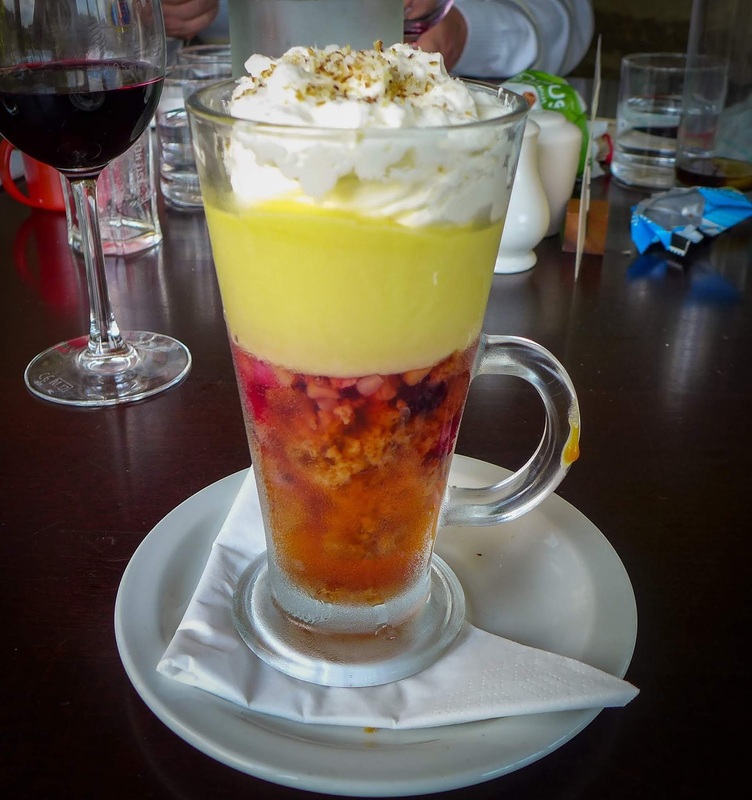 Over a lengthy, languid lunch with Mrs Diners’ parents we found the news to be mostly good. As we wandered into the bright extension section of the restaurant, Roxette’s Marie Fredriksson was urging me to listen to my heart. Sound advice, I thought, as I scanned a menu full of dishes as retro as the music on the stereo, and ordered the lamb’s liver. It is not exactly a challenging list. 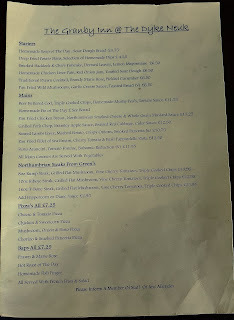 It is prawn cocktail, garlic mushroom and potato skins; it is pies, fish and chips and pork chops. We were as far away from the world of foams and spherifications as it is possible to be. Nothing intrinsically wrong with that either – much of this part of rural Northumberland enjoys the pace of an earlier, more gentle age, so why shouldn’t that include the food? I started with a vast trough of a thoroughly decent onion and thyme soup, seasoned boldly but not overly so. 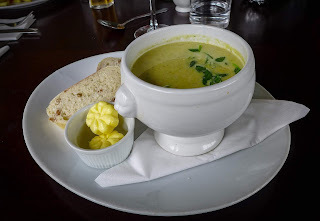 I’m pretty sure there were some leeks in there too, but regardless, it was just as you’d want from a hearty bowl of soup; not overblitzed, and served with some perfectly nice bread. Elsewhere, smoked haddock fishcakes had a lovely crisp, panko-y crumb that yielded to the fork, revealing well flavoured, steamy innards. The prawn cocktail was described as “traditional”. 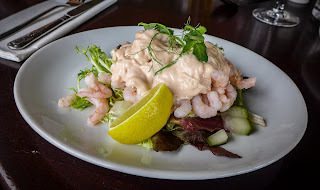 It most certainly was: a dollop of nondescript shrimps smothered in an artless blob of merely adequate Marie Rose sauce. It took me straight back to the pub lunches of my youth. This was a treat then; now, not so much. I think I’d like to see a just a little more effort or creativity, especially as The Granby Inn has an award-winning chef in Michael Hall. I guess he knows his market, though. A homemade fish finger bap on the other hand was a rather wonderful thing, a healthy wodge of crisp battered cod poking attractively out from each side of an airy-soft bread roll. 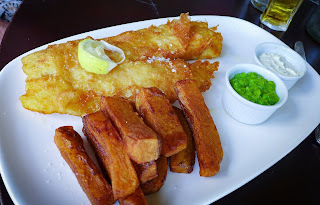 Shame about the skinny chips, which were disappointingly pale and flaccid. With chips, as with so much else, flaccid is of little use to anyone. Best of the main courses was probably a whacking great pork chop, grilled into glorious shades of tan and burnished gold. 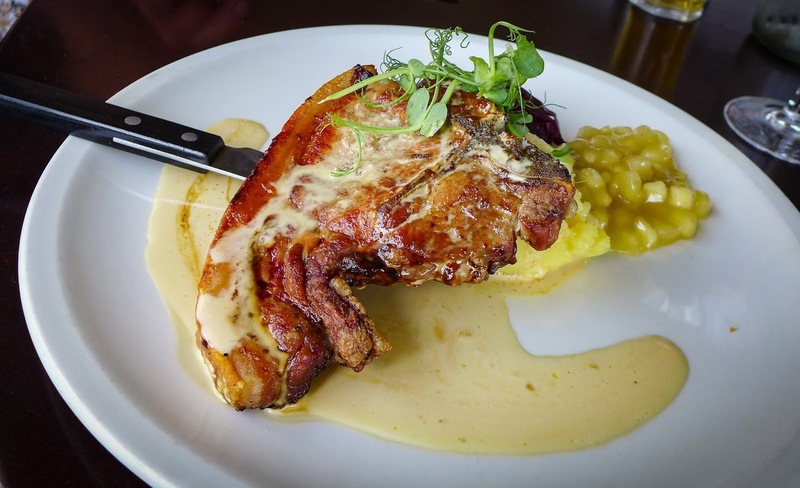 There was a bit of a chew to it, but it had plenty enough porky flavour to reward the endeavour, and a lovely rich ribbon of crisped fat to boot. Braised red cabbage and an apple sauce provided the necessary tang and lift, while a cider cream sauce soothed. 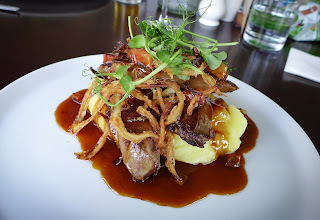 That lamb’s liver I had ordered came slightly, and annoyingly, overcooked. It lacked any blush of pink. A shame, for it had good flavour from its searing and came with an enjoyable tangle of crisped onions, a fine mash and a good sticky-rich sauce. However a more serious crime had been committed with Mrs Diner’s “pie” of the day. I actually shook my head as I broke out those quote marks, but I had no choice. 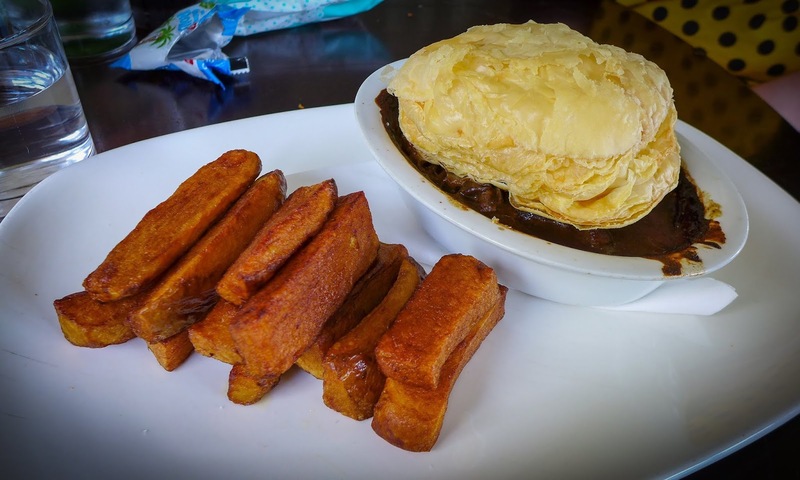 I thought that we’d got past the point at which it was permissible to balance a disc of puff pastry on top of a bowl of stew and call it a pie, but apparently not. All chefs everywhere, please note: pies have sides, and bottoms. A shame, for the stew was good, hunks of meat falling apart in full-flavoured ale gravy. The accompanying triple-cooked chips were no good either; the whole point of this technique is to get the things crisp. These were dull lengths of sturdy but stodgy carb. 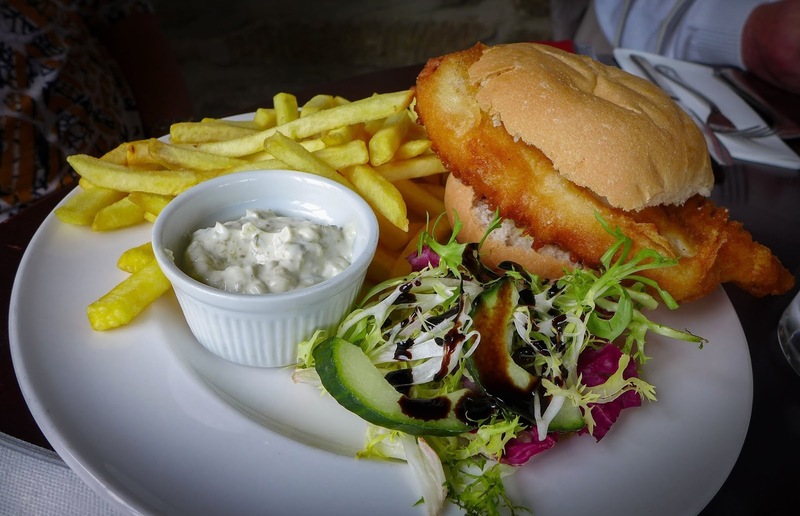 The same drab wodges afflicted a portion of fish and chips, although whatever oil-based difficulties blighted their preparation was not apparent with the cod, which sported a fine coat of crisp batter and nice chunky flakes. Good mushy peas too. 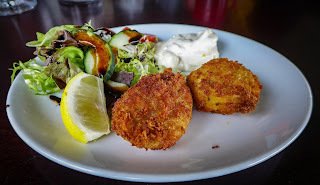 Starters were mostly £6ish, with mains hovering around £12 and puddings all £5.95. Service was attentive and charming. I drank a glass of Rioja of indeterminate origin or vintage, which was a bit on the fusty side. It’s probably better to stick with beer. 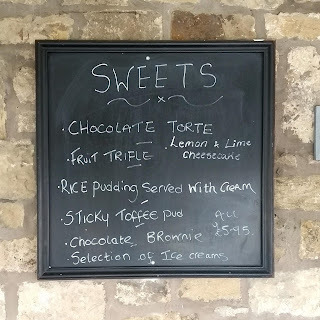 All portions were generous to a fault, meaning we had no need for pudding other than professional completeness. 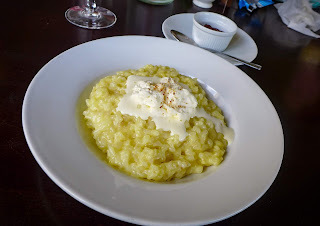 I managed to put away most of a really comforting bowl of rice pudding - no skin, sadly - with cream and jam, before admitting defeat. 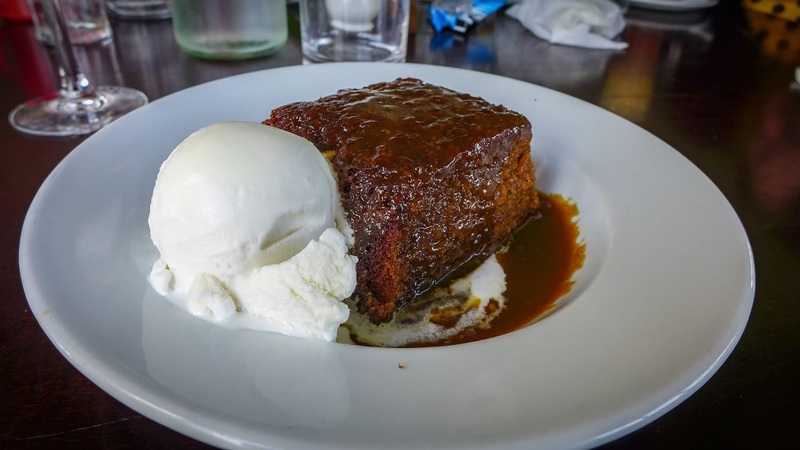 A sticky toffee pud lacked dates, as far as I could tell, but did have a lovely rich sauce and came with decent vanilla ice cream. Mrs Diner’s fruit trifle was pretty basic, but won me over with its layered retro charms. It was clearly a contemporary of the prawn cocktail. 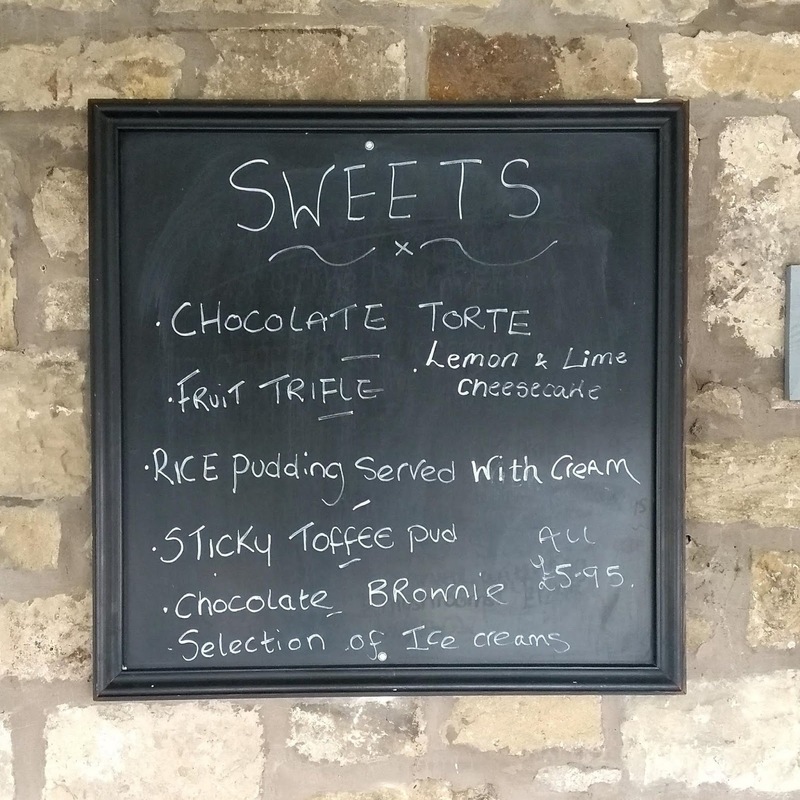 All these puds reminded of decent-to-good versions of nostalgia-inducing school dinners. That might not sound like praise, but it is, kind of. 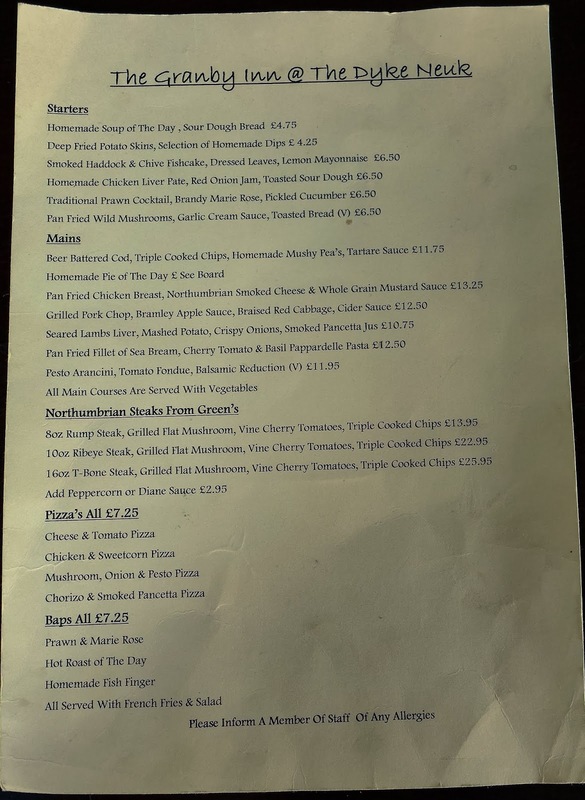 This is, deliberately, a menu of Things People Like To Eat, served in a sturdy old girl of a pub in glorious countryside. Michael Hall wasn’t in the kitchen when we visited, but seems to have found steady hands to run things for him. I wish the new owners and their kitchen team every success. Our wonderful region is enlivened and improved by places like the Dyke Neuk. If they could just sort the chips out and make a proper pie, it would be enlivened and improved even further.